This book is the generously illustrated, lavishly documented, critically narrated story of one of the most significant art collectives of the late twentieth century. 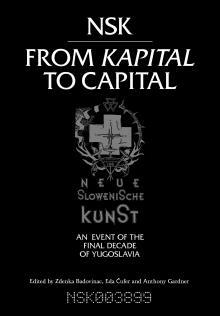 In 1984, three groups of artists in post-Tito Yugoslavia—the music and multimedia group Laibach, the visual arts group Irwin, and the theater group Scipion Nasice Sisters Theater—came together to form the Neue Slowenische Kunst (NSK) art collective. Employing music, video, film, exhibitions, writing, graphic design, architecture, theater, and public relations to probe the aesthetic possibilities of declining socialism and proliferating capitalism, NSK introduced an idiosyncratic version of postmodernism (the Retro-Avant-Garde) into the globalizing cultural sphere. Combining primary documents, period artifacts, critical essays, and contextual notes, NSK from Kapital to Capital documents NSK’s collective practice during the final decade of Yugoslavia—from the first (and banned) Laibach concert (1980) in a small proletarian mining town in Slovenia to the series of projects launched by individual NSK groups entitled Kapital (1991-92). This illuminating chronicle of NSK’s work and its reception is produced in conjunction with the first major museum exhibition devoted to NSK. Designed by Novi Kolektivizem (New Collectivism), the graphic design section of NSK, the cover of each individual copy of the book is printed with a custom detail; no two covers exactly are the same. Copublished with Moderna Galerija / Museum of Modern Art, Ljubljana, Slovenia.